An Opportunity to Hear An Interview of Dove of Oneness Telling About NESARA, 9/11, ST. GERMAIN & SANANDA’S INVOLVEMENT With NESARA! On May 30, 2010, the woman responsible for keeping NESARA within the public memory died. Just hearing Dove’s voice once more filled me with emotion and appreciation for all that she did to inform the public about the marvelous benefits NESARA– & now, GESARA–are about to bring the world. Americans were to get NESARA on 9/11/2001 … instead, we got the horrors of 9/11! Dove states what many working for NESARA knew at the time, NO MUSLIMS WERE INVOLVED. 9/11 WAS AN INSIDE JOB! Filed under: Dove of Oneness, NESARA |	Comments Off on An Opportunity to Hear An Interview of Dove of Oneness Telling About NESARA, 9/11, ST. GERMAIN & SANANDA’S INVOLVEMENT With NESARA! TRIBUTE TO DOVE OF ONENESS without whom we would not know of NESARA! As the Light saturates our Mother Earth and our ONE FAMILY, many marvelous events are beginning to unfold. Our Mother/Father God’s Divine Plan for ALL their children is one of LOVE, PEACE, & PROSPERITY. Whether or not we remember our Soul’s commitment to this present incarnation, we came to Earth to learn not to run from darkness, but to overcome it—both in ourselves and on a planetary level! It is for this reason that today, and henceforth, is monumental in its potential significance. CAN WE, WILL WE, COME TOGETHER AND FOCUS LIGHT ON OUR PLANET AND THE UNFOLDING OF THE DIVINE PLAN, INCLUDING NESARA—the National Economic Security & Reformation Act—and GESARA—the Global Economic Security & Reformation Act? 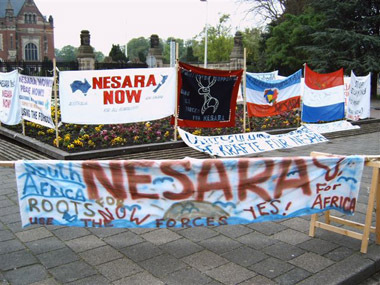 In the early 2000s, people from all over the world crafted banners to be displayed in front of the Peace Palace in Hague, Netherlands. The world was ready for peace, prosperity, and familial love! However, we had yet to overcome the darkness. The false flag event of 9/11 is just one of the many dark obstacles that have been perpetrated to prevent the transformation of our planet from manifesting. 9/11 achieved its goal … NESARA was not, and has not been announced, just as we continue without an official announcement of our Galactic Family’s presence with us. Doubt that NESARA was real … that it would ever be announced became the dominant mindset. Little do we realize that our own doubt creates a tremendous obstacle to a better life for all of us. Fear, doubt, ridicule of those who continue to hold fast to the Divine Plan unfolding—all manifest as our failure to overcome the darkness. BUT FIRST, each of us can do our part to manifest the NESARA LAW as the LAW OF THE LAND! Both of these announcements will benefit humankind beyond our wildest dreams! I encourage all of you to study the above sites and become familiar with the GOOD that is ready and waiting for us as we focus on the Light unfolding in marvelous ways on our Mother Earth! Focusing on the Light in combination with knowledge of what the Light is holding in store for each of us is the Way to hasten our Good manifesting in our lives. On the other hand, doubt, fear, and disbelief will continue to hold our Good in abeyance. Thank you, Dove of Oneness, for your tireless work in refusing to allow the NESARA LAW to be forgotten! May each of us follow in her footsteps by dedicating our thoughts, prayers, service, and faith to envisioning and bringing to fruition a world in which we, as a Galactic/Planetary Family share in the glories of living on a Lighted Planet! We have evolved a very long way … now we stand at the crossroads! We have only to make the turn and face the Light in full faith that LIGHT NOW RULES OUR PLANET! Even though darkness may attempt to overcome the Light, remain firm in your focus on the Light! Thank you, Dove of Oneness, for showing us how to serve the Light regardless of the obstacles placed before us! Dove returned HOME on May 20, 2010. I am sure she is cheering us onward to full disclosure of the NESARA/GESARA LAW and OUR GALACTIC FAMILY’S PRESENCE WITH US! Filed under: Dove of Oneness, Dr. Kathyrn May, NESARA |	Comments Off on TRIBUTE TO DOVE OF ONENESS without whom we would not know of NESARA! On May 30, 2010, Dove of Oneness (her code name) returned to spiritual realms. For years, Dove worked tirelessly 24/7 to bring forth an announcement of NESARA and its benefits. As has been true of anyone working in opposition to the dark cabal, Dove was mercilessly ridiculed and controversy followed her every step. Since her death, her website has been deleted, along with the years of reports she issued to keep those desiring to have NESARA announced up to date. “I remember how happy I felt on September 10, 2001, when I heard this so-called last step had been accomplished and that it looked like we would have NESARA announced in the next 48 hours. Then on September 11, 2001 at 6:30 a.m. Pacific Time, I was awakened with a phone call about the attacks on the WTC. As I have reported, Alan Greenspan is the White Knight whose doctoral thesis is the basis for the new U.S. Treasury Bank and currency backed by precious metals. I’m told Greenspan has dedicated his life to being in the right position to bring forth this far SUPERIOR currency and banking system which truly does provide considerable ECONOMIC STABILITY compared to the dark agenda controlled Federal Reserve system with fiat based currency. I’m told Greenspan was scheduled to begin his part of the NESARA U.S. Treasury Banks and new currency announcement at 10 A.M. EDT on September 11, 2001. I’m told that in conjunction with this initiating of the new U.S. Treasury Bank system, a very important international banking computer center on Floors One and Two of the WTC was to begin doing a computer download to U.S. banks at 9 A.M. EDT on September 11, 2001. I’ve been told many details about how the dark agenda CIA planned, and using certain remote processes, carried out the 9/11 attacks on the WTC and the other attacks on 9/11. I’m told that a group of about 100 people in a dark agenda CIA unit hastily developed the whole 9/11 attack scenario in August 2001. I’m told this group carried out the attacks and staged the so-called cell phone calls purported to be from passengers on the commercial airlines by using voice impersonation technology and other remote technologies. I’m told the TRUE story of how these employees of the federal government CIA agency staged the 9/11 attacks WILL COME out because the White Knights have some of these CIA personnel in custody and have PROOF that this was a dark agenda CIA operation. I’m told the White Knights also have the people who used remote pilot technology to fly a small white private plane loaded with explosives into the Pentagon at the EXACT location where the White Knights in the U.S. Military had their new communications center which was coordinating activities supporting NESARA’s implementation nationwide. The Pennsylvania location where the commercial airliner went down on 9/11 was also the location of something not visible that was related to the NESARA implementation.